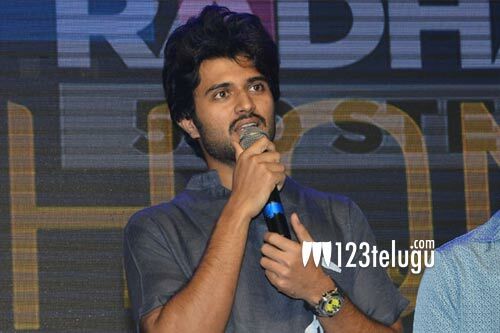 Hero Vijay Deverakonda was the special guest at Suryakantam’s pre-release event tonight. The young heart-throb’s presence in the event was a sweet gesture for the film’s team. In his speech, Vijay revealed that he attended Suryakantam’s pre-release event because none of the Mega family stars like Nagababu, Ram Charan and Varun Tej were available for the event. “When I came to know about this, I felt like I should attend the event a do the ‘big brother’ duties,” said Vijay. Niharika plays Suryakantam in the movie. Rahul Vijay is the male lead and Mumbai actress Perlene Bhesania will be seen in a key role in the movie. Noted US distributors Nirvana Cinemas has bankrolled the project. Debutant. Pranith Bramandapally is making his directorial debut. The film is all set to hit screens on March 29.